alleged war over the Maoists, Arundhati Roy again proved her courage. 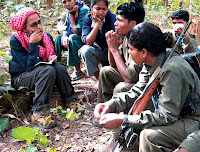 As mentioned earlier by her in her book that about 32000 tribals were branded Maoists and thrown behind bars just because they refused to move from their lands to make way for a mining corporation. She also didn't support the wrongdoings of the maoists. Surprisingly the tribals believe in them than the system. It would be good if the Maoists lay down their arms and get into talks with the government because we as citizens do not want to see our government waging a war against its own people.